From the start of the incubation phase, a coach will be assigned to the young entrepreneur. The coach will be responsible for the young entrepreneur’s personalized follow-up. This will be either an Entrepreneur in Residence, or another expert known for his experience in the field of entrepreneurship. The incubated entrepreneur does not choose his coach. Nevertheless, he has the possibility to explain his wishes, properly justified, to the VentureLab. At this stage, the young entrepreneur goes through a trial period of 3 months in order to get familiar with the VentureLab’s working process. After this trial period, a mixed jury will evaluate his motivation, integration, implication and project’s relevance. For 14 years, Cide-Socran (support organization) has developed an expertise and some tools, which are at the VentureLab disposal. In addition to the Entrepreneurs in Residence’s work, another person from Cide-Socran is part-time funded by FEDER in order to support and equip the project manager toward his business’ creation and development. Wishing to develop the entrepreneurial spirit of young people, the University of Liège created, with the board of directors’ approval on April 9th, 2014, a « Student-Entrepreneur » status in order to provide students with the possibility to work on both their academic course and entrepreneurial experience. This status allows students to benefit from particular adjustments (course/exams schedules, spread, entrepreneurial project support, …). It enables them to conduct simultaneously learning and entrepreneurial activities while maintaining identical academic requirements. It also gives access to a personalized and individual support. This opportunity is open to all students requesting it and meeting the required conditions to benefit from it. Beyond the challenges related to the student’s personal project, the development of the entrepreneurial spirit is a major asset for the future of our region. As such, the implementation of this status shows the academic institution’s wish to actively fulfill its citizenship mission. 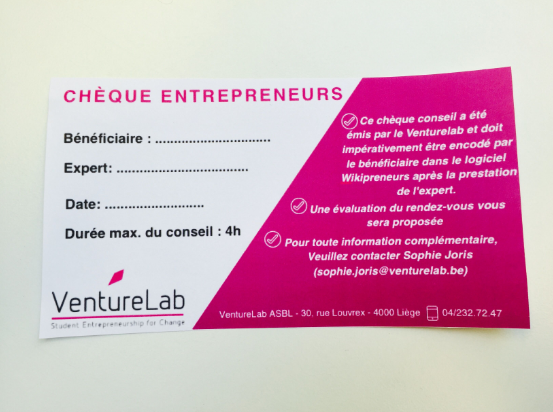 The “chèques entrepreneurs” is an expert support in the form of a cheque (one hour=one cheque). These cheques give access to hours of free expertise in fields related to the project’s progress such as accountancy, finance, marketing, audit, etc. It provides incubated entrepreneurs with a fully equipped coworking space at their disposal (printer, Internet, office supplies, phones, a mail reception center and access to a copy machine). Each workshop shows dynamism and is project-oriented. Trainers bring a practical aspect to the participants. Workshops are based on the participants’ exchanges, a personalized approach and on a will to build with them concrete deliverables that allow them to realize their project step by step.